Kim Jong Un is a diehard basketball fan who loves the Chicago Bulls. Dennis Rodman, who has been an informal basketball diplomat of sorts to North Korea, arrived in Singapore Monday ahead of President Donald Trump's historic summit with Kim Jong Un. The retired NBA Hall-of-Famer told reporters at the airport that he is unsure whether he will meet with his friend Kim and the White House adamantly denied last week that Rodman has any official role in the summit, but Rodman told reporters Monday that he is "just happy to be a part of it because I think I deserve it." "I think I brought awareness to a lot of things around the world." Rodman struck a cautiously optimistic tone when asked about summit expectations, saying, "it should go fairly well but people should not expect so much for the first time." Prior to then-CIA Director – and now Secretary of State – Mike Pompeo's surprise April meeting with the North Korean leader, Rodman was one of just a few westerners to ever meet with Kim, who has been openly hostile towards western nations, including the United States. 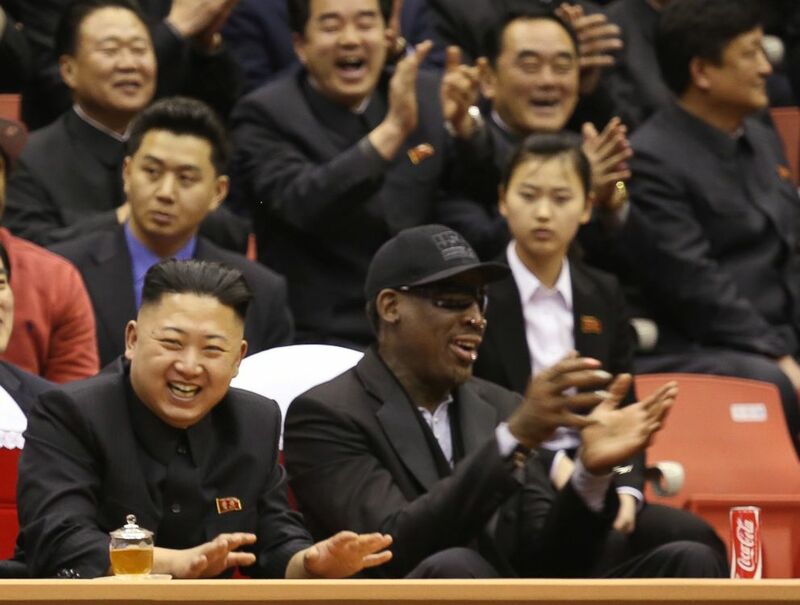 (AP FILE) North Korean leader Kim Jong Un, left, and former NBA star Dennis Rodman watch North Korean and U.S. players in an exhibition basketball game at an arena in Pyongyang, North Korea, Feb. 28, 2013. Kim, who took power following the death of his father in 2011, is a diehard basketball fan with a special affection for the Chicago Bulls, and apparently he had a soft spot for Rodman, who was part of the Bulls during Michael Jordan's legendary reign. Kim invited Rodman to Pyongyang, the capital of the isolated authoritarian state, for the pair's first meeting in March 2013. The basketball star was pictured hugging Kim and was criticized by human rights activists for telling him, "You have a friend for life." (Kyodo News via Getty Images, FILE) Former U.S. basketball star Dennis Rodman, right, and North Korean leader Kim Jong Un, 2nd from left, watch an exhibition basketball game between American and North Korean players at the Pyongyang Indoor Stadium on Jan. 8, 2014, with Kim's wife Ri Sol Ju sitting next to Kim. 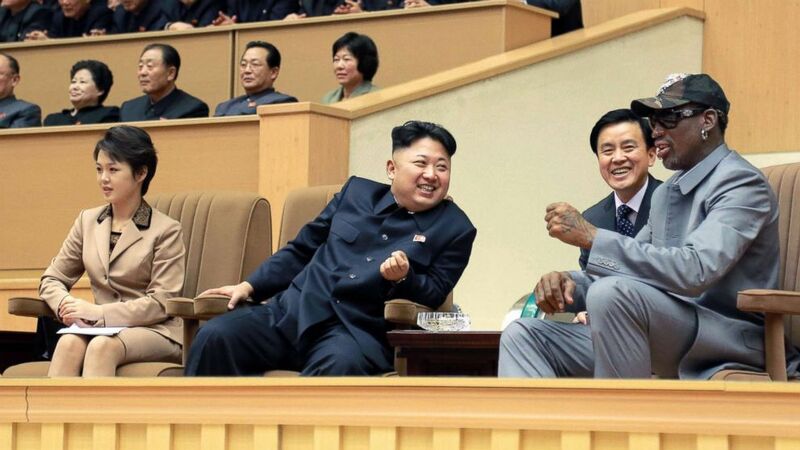 The unlikely pair's friendship continued to blossom and the basketball star made several other trips to North Korea, often accompanied by other basketball players, where he spent time with Kim. During his January 2014 trip, Rodman courted controversy again when he infamously sang "Happy Birthday" to Kim on the basketball court and appeared to bow to the North Korean leader. In an interview defending his January 2014 trip, Rodman found himself in the midst of a diplomatic dust-up when he appeared to defend North Korea's imprisonment of American missionary Kenneth Bae. His comments prompted criticism from Bae's family, U.S. officials and human rights activists. Rodman later apologized for his comments and wrote a letter in November 2014 addressed to “My dear friend for life, Marshall Kim Jong Un," begging for Bae's release. Although Rodman said he did not receive a response to his letter from Kim, Bae was released later that week after being detained for two years and in a 2016 interview he thanked Rodman, saying the NBA star's controversial rant was "a catalyst for my release" because it got so much attention. (Kim Kwang Hyon/AP) Former NBA basketball star Dennis Rodman presents a book titled "Trump The Art of the Deal" to North Korea's Sports Minister Kim Il Guk on June 15, 2017, in Pyongyang, North Korea. 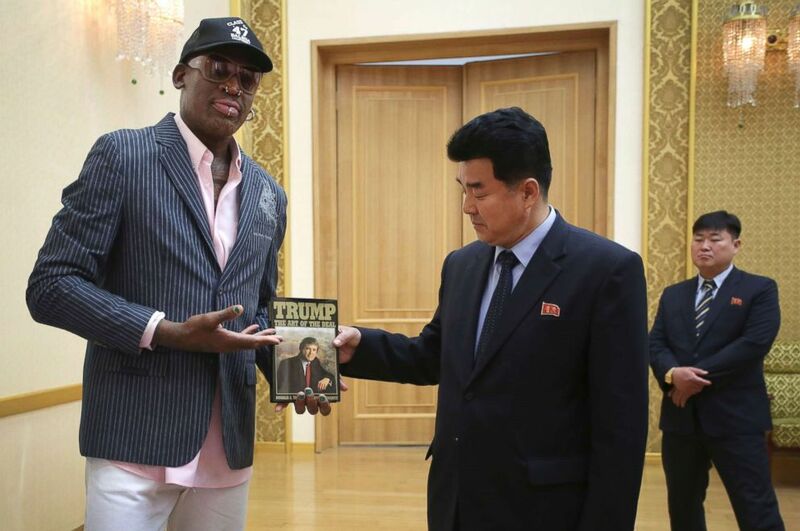 In 2017 Rodman presented North Korea's sports minister with a copy of Trump's 1987 book, "The Art of the Deal" as a gift to Kim. Trump, who was Rodman's boss on two seasons of "The Celebrity Apprentice," details his negotiation style in the book. "I think [Kim] didn't realize who Donald Trump was at that time, I guess, until he started to read the book and started to get to understand him," Rodman claimed in a May interview with TMZ. Rodman endorsed Trump's 2016 presidential campaign in July 2015, tweeting, "@realDonaldTrump has been a great friend for many years. We don't need another politician, we need a businessman like Mr. Trump! Trump 2016." "Thank you @DennisRodman. It's time to #MakeAmericaGreatAgain! I hope you are doing well!" Trump responded. When asked on Thursday whether Rodman would have any role in the summit with Kim, Trump said, "No, he was not invited, but he's a nice guy. I like him."